Last Friday NSE Equity market turnover is on record volumes trades at more than Rs 43,621 crore. Previous high in equity market segment was Rs 41,113 crore hit on April 21 this year. Nifty Index and Bank Nifty Index made a big comeback on last trading day with bigger gain and made a weekly returns of -0.3% and 1.48% respectively. India VIX is in declining trend which indicates that downside fear in the market got eroded off. SGX Nifty futures on friday closed at 8493.5 post GDP announcement. Nifty Futures and Bank Nifty Futures hourly charts are in positional uptrend with the support zone coming around 8331 and 18458 respectively on hourly basis. Position could reverse to positional downtrend if the support zone breaks on the hourly charts. Nifty Weekly Charts are still below 5EMA High (8480.9) however Bank Nifty managed to close above 5EMA High(18687) which indicates that longterm trend had turned to bullish mode in Bank Nifty and still confirmation is required from Nifty futures to close and trade above 8480. 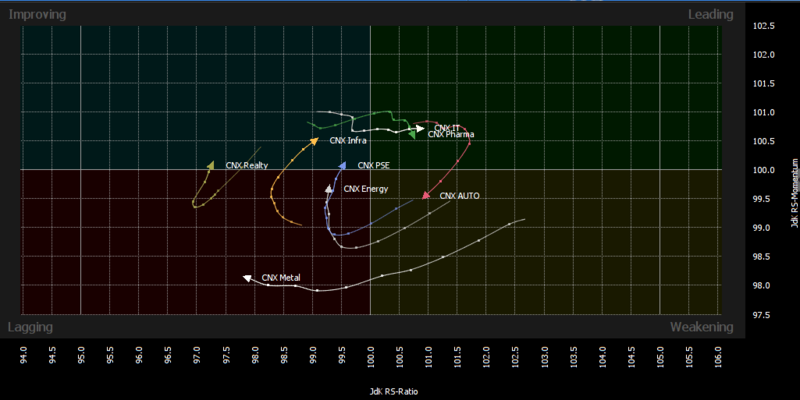 RRG Graph Study shows CNX Energy, CNX Infra, CNX Realty , CNX PSE are the sectors where the momentum is gaining and likely to be the out performers with respect to Nifty. CNX Pharma momentum is falling, CNX Metal is in the Lagging Quadrant, CNX Auto momentum is falling and enters the weakening quadrant and so the likely under-performers. 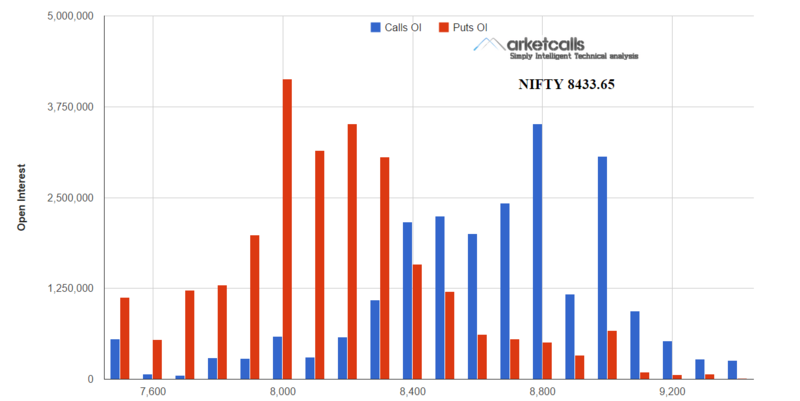 Nifty Option Open Interest builtup is in primitive stage and currently high open interest built up are seen in 8000PE and 8000CE levels. To get more clarity from the Open Interest we have to pass few more days to know where most of the option players are interested in building open interest. Want to know how to learn to analyze the different charts..